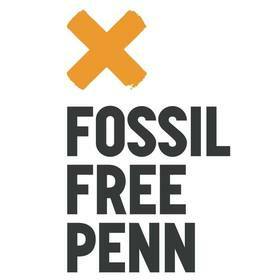 Fossil Free Penn demanded divestment from coal and tar sands in a second proposal for divestment, citing the financial risk and social injury caused by these investments. 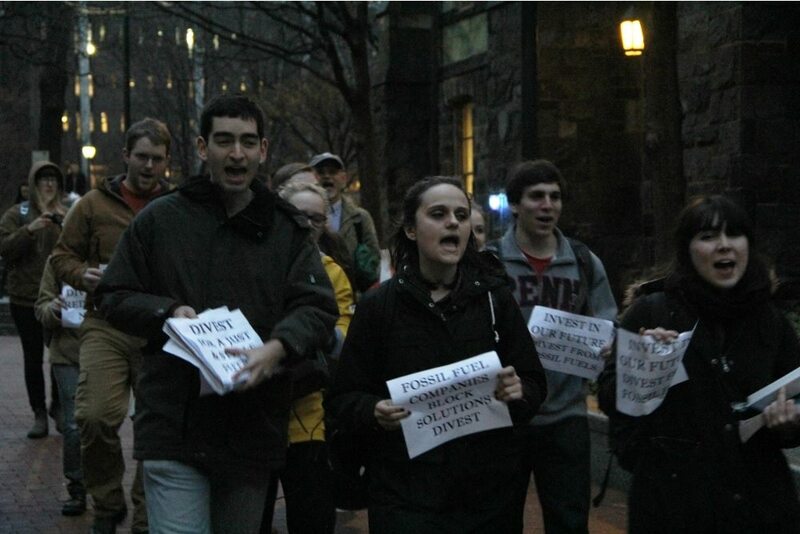 60 students marched to a meeting of the Board of Trustees of the University of Pennsylvania to demand divestment in a silent protest. After a multi-day, overnight sit-in in College Hall to demand divestment, 130 students flooded College Hall in a show of support. 69 were cited by the university for disciplinary action. 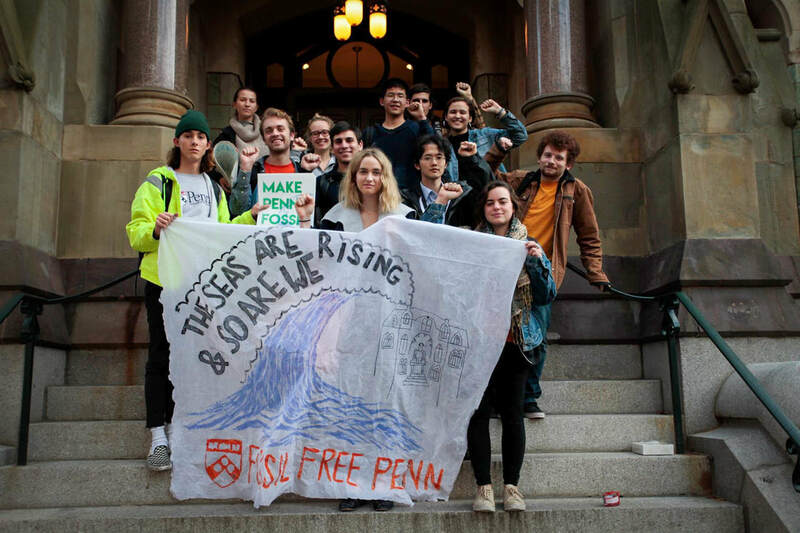 Building on PCM's momentum of climate justice, Fossil Free Penn met for the first time and established demands for our own university. 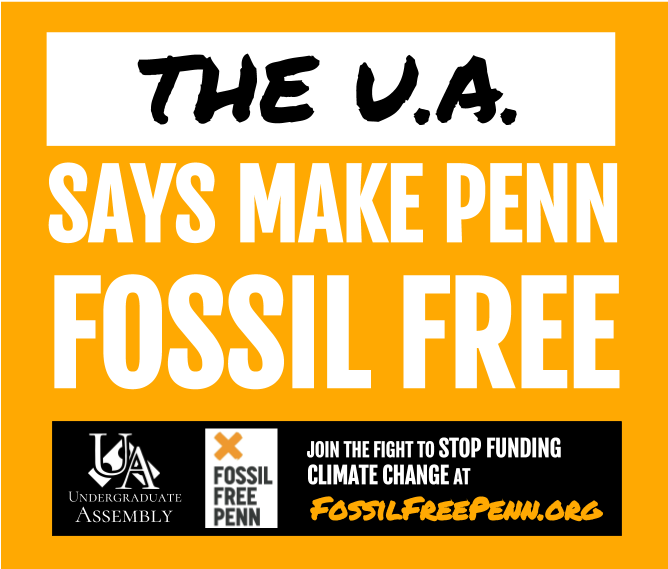 The Undergraduate Assembly voted in support of divestment 17:1. This vote demonstrates "ongoing student support" constitutionally required by the Trustees to consider divestment of its endowment. 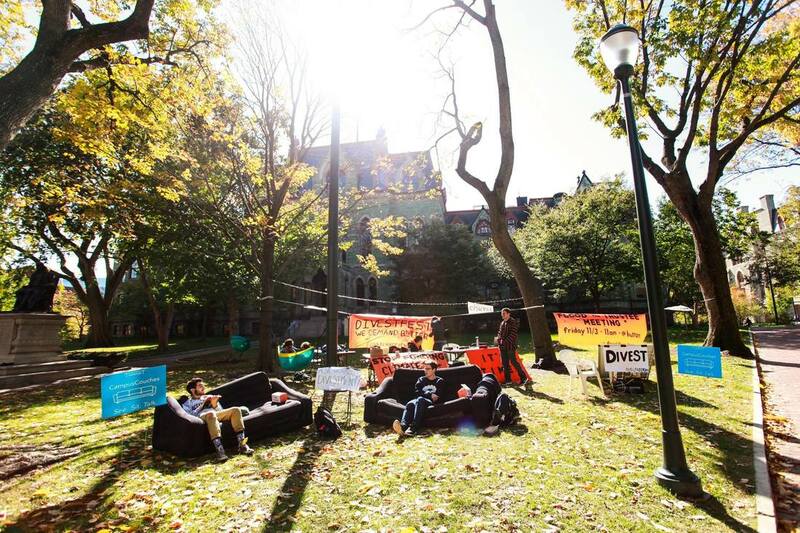 On College Green, Fossil Free Penn hosted Divestfest, an event focused on education and building a community aligned with the goal of fighting for climate justice and divestment of Penn's endowment from the fossil fuel industry. 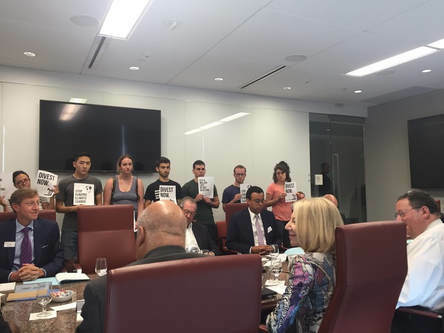 Students silently protested a meeting of the Executive Committee of the Board of Trustees of the University of Pennsylvania. 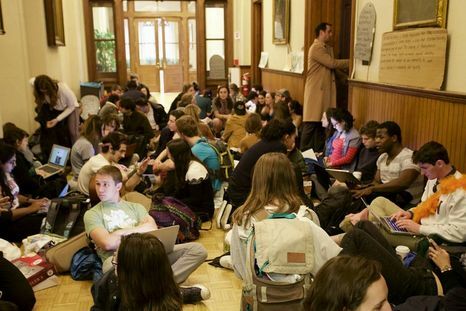 About 30 Penn students staged a sit-in in College Hall to demand a meeting with Penn President Amy Gutmann and Head of the Board of Trustee's, David Cohen. 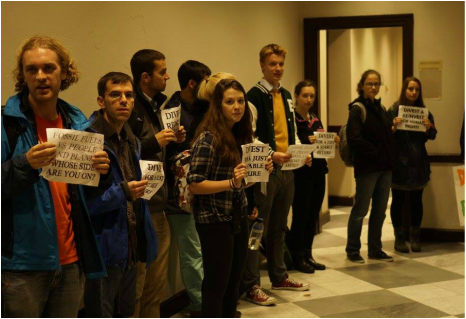 The students remained in the building until demands were met. 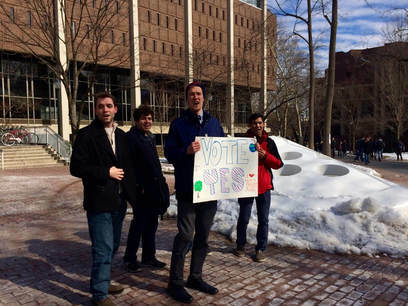 Penn students responded to President Gutmann's launch of Climate Action Plan 2.0. We submitted the petition for undergraduate referendum to the Nominations & Elections Committee according to the Fair Practices Code. 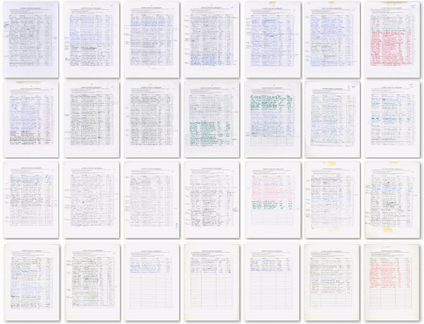 The referendum reached more than 650 signatures. We held a rally outside of the ARCH building with powerful speakers. 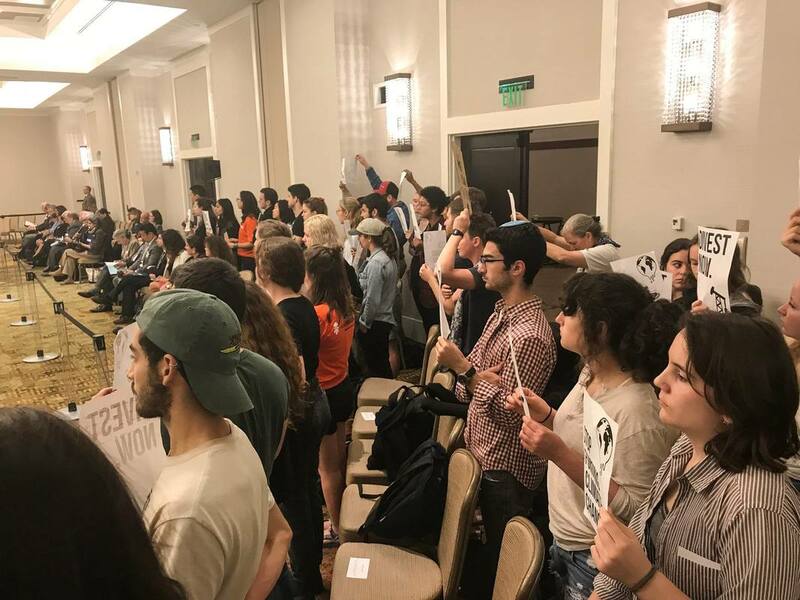 Then, we marched over to Houston Hall for a silent protest outside a University Council meeting, encouraging dialogue about divestment in preparation for submission of the divestment proposal. 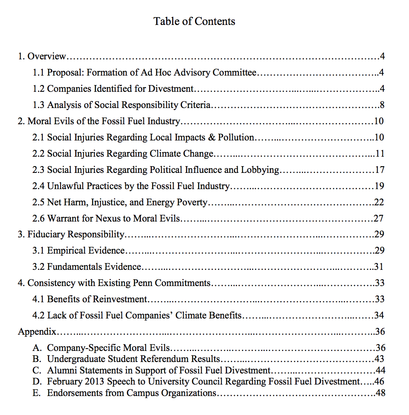 FFP's fossil fuel divestment proposal is submitted to the University Council Steering Committee, in accordance with the official Guidelines and Procedures to consider divestment proposals. 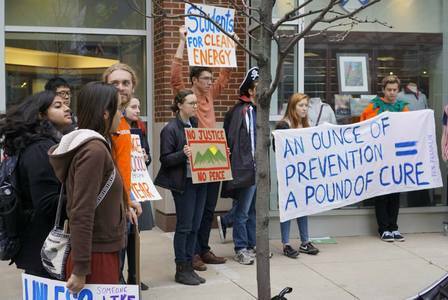 The University Council Steering Committee debated and accepted the divestment proposal and makes plans to create the Ad Hoc committee on divestment, as charged by the Trustees in the procedures. We held a rally on College Green before heading over to the University Council Open Forum, where FFP members and supporters spoke promoting divestment. At the Open Forum, Wharton Graduate alumnus ('89) Brad Goz spoke about the financial benefits of fossil fuel divestment.